When you supply heat energy to a substance or you remove heat from it, then you can cause the substance to change its state. The heat energy that is taken in or given out by a substance when it changes state is called latent heat. When a substance changes from solid to liquid, the latent heat involved is called the latent heat of fusion. When the substance changes from a liquid to a vapour, latent heat of vaporisation is involved. For the Credit Level examination you need to know what is meant by the specific latent heat of [fusion: The joining of two atomic nuclei to make a large nucleus, with the release of radiation.] and the specific latent heat of vaporisation of a substance. These quantities tell us the heat energy that is needed to change the state of a specific mass of a substance, namely 1 kg, from solid to liquid and from liquid to vapour. You are also expected to carry out calculations on latent heat. The specific latent heat of fusion, l, of a substance is the heat needed to change a mass of 1 kg the substance from a solid at its melting point into liquid at the same temperature. The specific latent heat of vaporisation, l, of a substance is the heat needed to change the substance from a liquid at its boiling point into vapour at the same temperature. 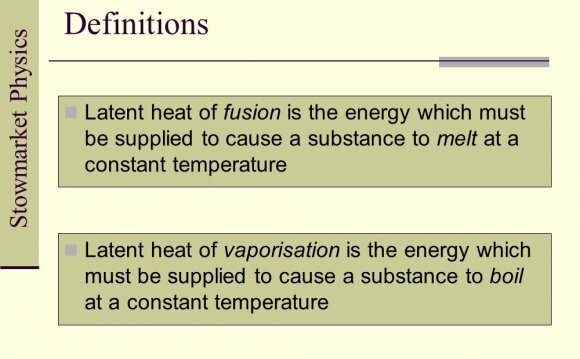 Specific latent heat of fusion and specific latent heat of vaporisation both have the same symbol, l, and are measured in joules per kilogram. The heat energy Eh that is needed to change a mass m of liquid from at its boiling point into vapour at the same temperature is given by the following relationship. The same relationship, Eh = ml, applies to the changing of a mass m of substance in its solid state at its melting point to a liquid at the same temperature. The only thing you have to remember for this case is that the symbol, l, stands for the specific latent heat of fusion. Here is a typical Credit Level examination question. Try the question and test your ability to use the relationship for latent heat. Then scroll down to the answer to see how you got on. 2 The heater in an electric kettle delivers 1.5 kW of power to 2 kg of water at its boiling point. The specific latent heat of vaporisation of water is 2.26 x 106 J/kg. 2.1 How much energy would be needed to boil off 1 kg of the water? 2.2 The kettle is switched on for 100 s.
(i) How much heat energy is delivered to the water in this time. (ii) How much steam is produced in 100 s?